It’s time to tune up your car, so you head to the auto parts store. If you are not familiar with which plug is correct for your car, what should you do? Many of the Parts Counter salespeople can look up what came as original equipment when the vehicle was new, which is a great help, also check your owners manual, but let me give you the 411 on spark plugs. Let’s start with the two most important spark plug facts. First, sparks like to jump from the sharpest point on the center electrode to the sharpest point on the side electrode. So you want a plug that retains its sharp edge for the most miles. Precious metals like platinum and iridium are harder and have lower melting temperatures than the nickel alloy electrodes found in traditional copper spark plugs. Second, the smaller the diameter of the center electrode, the lower the voltage needed to start the spark. 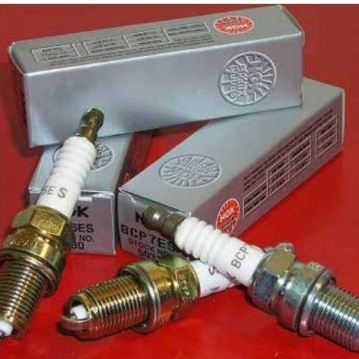 Keep those shopping tips in mind as you review the best spark plugs for your vehicle. Copper Spark Plugs have a solid copper core, but the business end of the center electrode is actually a 2.5 mm diameter nickel alloy. That’s the largest diameter electrode of all the spark plug types. Remember, the smaller the diameter, the less voltage required to initiate the spark. Nickel alloy is also softer than either platinum or iridium, so the sharp firing edge you get right out of the box tends to wear out quickly. Despite those shortcomings, copper spark plugs are still a good choice for certain applications. A single platinum spark plug is basically styled after a copper spark plug with a platinum disc welded to the tip of the center electrode (see photo). Since platinum is harder than nickel alloy, it holds its sharp edge for as long as 100,000 miles. Platinum spark plugs also run a bit hotter, preventing spark plug deposit buildup and fouling. Platinum spark plugs are usually the best spark plugs for newer vehicles with electronic distributor-based ignition systems and some (DIS) systems. If your owner’s manual recommends platinum spark plugs , don’t downgrade to copper spark plugs to save money. However, you can upgrade to either double platinum spark plugs or iridium spark plugs. Double platinum spark plugs were designed for “waste spark” DIS ignition systems. In a waste spark system, the spark jumps from the center electrode to the side electrode for the cylinder that’s on the compression stroke. To return the electrical pulse back to the ignition coil pack, the spark jumps backwards (side-to-center) on the partner cylinder. Since the partner cylinder is on its exhaust stroke, nothing ignites and the spark is “wasted”. You can’t use single platinum spark plugs or traditional copper spark plugs in these systems because the side electrodes aren’t designed to handle the reverse spark. But double platinum spark plugs, with a platinum disc welded to their side electrode, work exceptionally well. If you picked iridium, you guessed it: iridium is harder than platinum. In most cases, iridium spark plugs last about 25 percent longer than comparable platinum spark plugs. Because iridium is costly, iridium spark plug manufacturers reduce the diameter of the center electrode to as little as .4 mm. In addition to saving money, the “fine wire” center electrode of iridium spark plugs increases firing efficiency. Many carmakers require iridium spark plugs or iridium/platinum combination spark plugs for (COP) ignition systems. If your owner’s manual specifies iridium spark plugs, don’t downgrade to platinum spark plugs, or double platinum spark plugs, or even copper spark plugs. They won’t perform as well as the iridium spark plugs in this case. Depending on the year, make and model of your vehicle will depend on the type of plug you need to use.